Hypothyroidism stands for all different kind of thyroid gland hypo-function, independent of the origin. 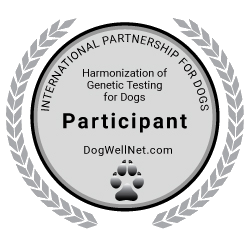 In Spanish Water Dogs sub-function of the thyroid gland can originate from a genetic source. In affected pups a delay in growth occurs, which becomes obvious at the time when normal pups from the same litter experience a growth spurt at about two weeks of age. Some pups suddenly die at this time. Opening of the eyes and the ear channels is substantially delayed and the thyroid glands (goiter) enlarge as paired swellings on the underside of the neck. Bones do not lengthen appropriately causing irreversible dwarfism. Early diagnosis opens the possibility to circumvent most of the symptoms by a daily medication with thyroid hormones for the rest of the dogs life. Otherwise, affected dogs have a very short lifespan and normally die as puppies. The causative mutation has been found by John C. Fyfe and his group at Michigan State University.